A, A, A, A, A, A, A, A, A, A....OK hit X to switch...going with Tepig...A, A, A, A, A, A, A, A, A, A, A. Please excuse me for casting a skeptical eye on Pokemon Rumble Blast, Nintendo's latest 3DS title and the first official Pokemon game for the system. Bad feelings still linger from its predecessor, the shallow WiiWare effort, Pokemon Rumble, and I still remember what happened when the company rushed a Pokemon game out the door for DS, just for the sake of having one available. Said game was the atrocious Pokemon Dash, circa 2004. That said, I hoped history would not repeat itself with Rumble Blast. Here was an excellent opportunity to try something different with the franchise while providing fans with a Pokemon adventure during the busy holiday shopping season. Thirty minutes in, and I have only one question: is this it? Don't get me wrong. A half an hour is by no means an adequate amount of time to judge a video game. For all I know, things get crazy from here on out. 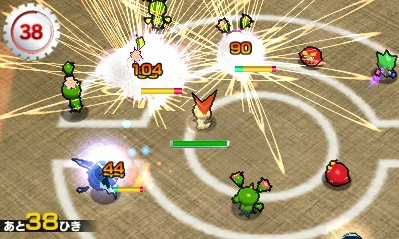 On the flip side, and unless it's a new Metal Gear filled with 25 minute cut scenes, the developer normally lays the groundwork for a game within the first ten to 15 minutes, so barring some unforeseen twist, Pokemon Rumble Blast is little more than a frantic hack-an-slash for diehards and the ADHD crowd. In fact, much of my experience was spent furiously mashing the A button to attack, then moving to another area to basically do the same thing. Here's the gist. 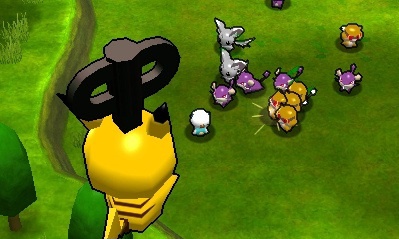 When people insert a Wonder Key into toy Pokemon (and subsequently twist this key), the tiny critters come to life and throw down in battle royales where only the strongest survives, WWE style. You begin the game as Pikachu, and must scour this fantasy world in search of new recruits that join your stable after taking a good old-fashioned beating. From there, you're able to bring up a list of acquired Pokemon and examine their stats. 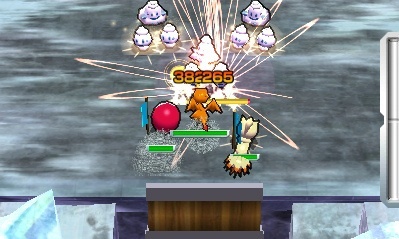 Some are obviously stronger than others and therefore have more hit points (HP). You'll also find familiar types, including electric, fire, grass, water and psychic. The key to success involves choosing the right Pokemon for the job. If you encounter a bunch of fire types, for example, water is the way to go. You can take down fire Pokemon with a grass type, but it takes significantly longer. After a while, you'll have a formidable gang of creatures ready for combat. In that 30 minutes, I "convinced" Tepig, Snivy, Oshawott, Rattata, Patrat and Minccino to join the group, and with over 600 Pokemon to find, players have quite a bit of ground to cover. On that note, it's common to have several of the same Pokemon (five Tepigs, for instance) with varying amounts of hit points. Thankfully, visiting the safe zone, Toy Town, lets you get rid of them to better manage your new pets. You'll also find the Glowing Fountain that heals all of your Pokemon by simply stepping into it. As for the epic battle royales, these contests force you to defeat all of the Pokemon, once again reinforcing the important point of selecting the best possible monster. You can always switch, but this happens in real time, where taking damage cancels the change, forcing you to retry in a safer location. Taking all of this into account, I still can't help but ask the same question: is this it? Does Nintendo expect me to invest several hours mindlessly pummeling other Pokemon and then competing in Royal Rumble style events? Seems like it, but I'll reserve final judgment for my review, which will post early next week.